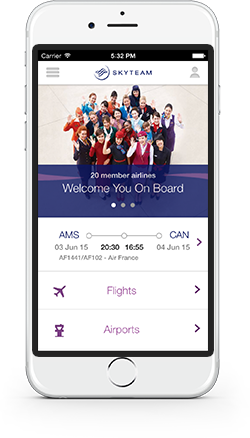 AMSTERDAM, 3rd November 2014 – SkyTeam, the global airline alliance, has launched a refreshed version of its App. Free to download and available for Apple and Android devices. The updated App now offers even more useful features for global travelers on the go. SkyTips: an easy-to-use database of airport travel tips shared by SkyTeam’s online community of more than 350,000 Facebook fans. The tips help customers make the most of their time at the airports and is available offline for easy access in flight mode. Customers can now add their SkyTips in the App, without needing a Facebook account. SkyPriority Finder: lets customers find out which priority airport services are available to them at every step of their journey. This is also available on SkyTeam.com. My SkyTeam: enables passengers to build a customized SkyTeam travel profile that includes their planned flights and favorite airports. This is also available offline. Lounge Finder: this popular feature, now available offline, enables customers to locate any of SkyTeam’s 516 worldwide lounges with ease and includes information about opening hours and amenities. Customers can also look up flight schedules of any SkyTeam member as well as check their flights status.. Detailed information about all 1,052 SkyTeam airports is available using the Airport Finder function. Find out how to download the SkyTeam App here.